Another dystopian novel! They’re seriously all the rage now, huh? As I read more and more dystopian novels, I get more and more critical of them. It’s hard not to, especially since there are so many of them, there’s a pressure to have a story that stands out from the rest. 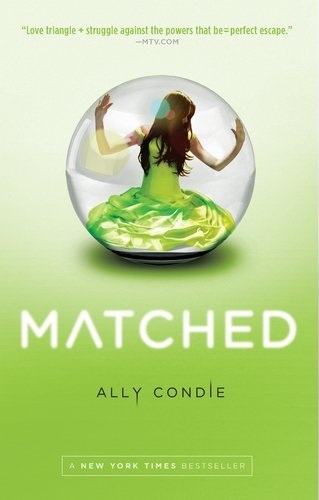 This time I am reviewing the dystopian world of Matched, a much-buzzed about young adult book. When I started reading it, I didn’t find it to have that stand-out quality. I thought the main character was too flat. She was boring, and seemed happy with her way of life. I didn’t feel convinced that she would change into a rebel of some sort. So after 50 pages, my mind began wandering elsewhere, and I gave up on reading the book. Weeks later, out of boredom, I decided to pick Matched back up and give it another try. This time I stuck on reading, in hopes that a good story would reveal itself somewhere in the middle. Luckily, I was right. Cassia Reyes is the main character in Matched. She lives in a world where the government makes all the choices for their people, like what job they have or who they will marry. The story begins with Cassia on her way to her Match ceremony with her best friend Xander. The Match ceremony is sort of like a debutante ball, if it were to reveal who your future husband or wife would be. Usually, matches are made between a boy and girl from different parts of the country, meaning that they most likely don’t know each other. However, there are rare occurrences where two are matched from the same city. Cassia becomes one of those rare examples when she is matched with her friend, Xander. Cassia and Xander are delighted by the news. At the ceremony, each person is given a port, like an iPad (But then again, I’m always imagining things wrong. lol.) that is full of information on their match. When Cassia gets back home, she opens the port to read about Xander. Only Xander’s face doesn’t pop up when she turns it on, but the face of another boy. A boy that she also knows. The story starts off slow and seems directionless. Cassia is inquisitive, but she pushes her curiosity down. It gets frustrating, and that’s why I had given up on it. I didn’t think that her transition into being a heroine would be convincing, since she seemed rather too comfortable with her life to begin with. Yet then, we are introduced to her grandfather and that’s when this story starts to take off. The relationship between Cassia and her grandfather is very telling, and it gave Cassia the depth that she lacked in the beginning of the story. Her last scene with her grandfather becomes the catalyst to rest of the story. Cassia changes and discovers all the beautiful things that her government is trying to hide from society. My favorite moments were when Cassia would relish a piece of poetry or Ky’s story. Author, Ally Condie was able to express the pure beauty and danger of those moments. I felt my heart race every time with Cassia’s, when she would read something new. While I do think the writing needs a little improvement, Condie really did nail those moments well. Matched was an enjoyable read. It had its highs and lows. I’m not crazy about the book, but it’s far from bad. I recommend it to anyone looking for a good dystopian read. As with almost all dystopian books, Matched is the first of the trilogy, so expect it to leave you hanging. Its sequel, Crossed, comes out in November. I won’t be rushing out to the bookstore to get it, but I will be thinking about it. Support our site and purchase Matched from our TYF Store!